The collision of two Marine jets off the coast of Southern California in November gave San Diego a front-row seat to the life-or-death consequences of delaying maintenance and denying training hours to Marine Corps aviators. The lack of funding for these core elements of the USMC mission — due mostly to Congress’ self-inflicted wound of sequestration — constitutes a breach of faith with the men and women who risk their lives serving our nation. Sequestration’s toll on the core “man, train, and equip” missions now has a body count, and United States Marine Corps aviation is the canary in the coal mine. The recent removal of USMC Fighter Attack Squadron 232’s commander is the fourth involuntary change in aviation leadership in 2016, a phenomenon underscoring a much broader deterioration in the quality of USMC aviation. Facing untenable budgetary instability and frequent deployments, readiness has plummeted and crashes have increased precipitously. Department of Defense accountability may come via an inspector general report in 2017, but that is too little, too late. In the wake of these accidents, the Marine Corps Times highlighted the endemic problems facing USMC aviation; the mandatory sequester — followed by budget caps — has limited flight training hours, the maintenance and upgrading of platforms, and the purchase of new systems, plaguing readiness and corresponding with a marked increase in aviation accidents. In the wake of these accidents, USMC spokeswoman Capt. Sarah Burns confirmed there are 85 F/A-18s available for training, less than half the 171 required. After Gen. Neller’s March testimony, the USMC began investigating whether there was a “linear correlation” between the lack of training hours and increase in aviation accidents. 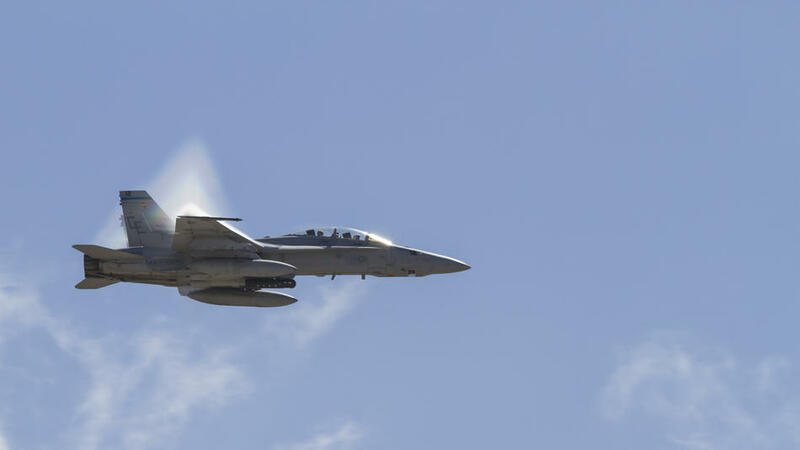 As part of debate over the National Defense Authorization Act in April, Lt. Gen. Davis testified to issues arising with the F/A-18 Hornet, noting the operational tempo and overutilization had led to a “low flight time and short training progression” for pilots. Since the beginning of the summer of 2016, there have been seven “legacy hornet” crashes or incidents involving U.S. forces, three of which have killed their pilots. On Oct. 26, an F/A-18 crashed on a training flight, and two weeks later two F/A-18s collided midair, while in June a Blue Angels pilot was killed in a crash, and on Dec. 17, Naval aviation grounded all F/A-18s in response to yet another problem. Without change, armed forces aviation will be defined by maintenance failure and deadly training accidents. The USMC stand-down on all nondeployed aviation over the summer played well with critics, and is a first step in re-evaluating the safety with which aviation can function at these low levels of funding, but does not go far enough. The problem is so dire that a single safety review is a drop in the bucket of deferred costs. Aviation has always been a high-risk endeavor and even in the best of operating environments, accidents do happen. However, the inexcusable degradation of readiness at the hands of an irresponsible Congress is simply unacceptable. This should be a bipartisan issue. Those suffering at the hands of sequestration are our men and women in uniform. It is imperative that Congress remove the danger inherent in allowing aviation to degrade by providing robust funding increases and further safety measures. “It’s a dangerous business” is no longer a sufficient explanation. Schafer is a research assistant for the Military, Veterans & Society program at the Center for a New American Security. For a six-month period that ended Wednesday, the noisy Surf Air planes flew the Bayside Visual Approach into San Carlos at least 60 percent of the time, “when weather and air traffic conditions” allowed, according to Assistant San Mateo County Manager Mike Callagy. On Thursday, the planes are to resume using the GPS approach, which had drawn thousands of complaints from residents in Atherton, Menlo Park, Los Altos and elsewhere. “I just got a letter from San Carlos Airport,” Atherton Mayor Michael Lempres said on Tuesday, revealing the news that isn’t likely to please many of his constituents. Kelly said noise complaints can continue to be made by phone on the Noise Complaint Hotline at 844-266-6266, or online at http://www.planenoise.com/sanmateo/tY5Ru4wa/. Lempres noted that Atherton already sends people to a working group tasked with working on the issue. In August, the pavilion at Atherton’s Holbrook-Palmer Park was filled to overflowing when 185 people showed up to talk about the noise from Surf Air airplanes. Many were angry about Surf Air, which began operations in 2013 with a few flights per day from San Carlos to Los Angeles and back. By August, it had expanded to 22 outgoing and 22 incoming flights a day. There have been thousands of complaints, citing annoyances such as ruined phone calls, woken babies (and adults) and glassware shaking on shelves caused by low-flying aircraft. DAYTON, Ohio (WDTN) – Southwest Airlines will stop operating at Dayton International Airport come early June and will be going to Cincinnati/Northern Kentucky Airport. The announcement was made Wednesday afternoon that Southwest will be operating out Cincinnati/Northern Kentucky Airport. It will officially cease operation on June 3rd, the end of their current flight schedule. The City of Dayton released a statement regarding the decision Wednesday. It said, “City of Dayton leadership was informed by Southwest Airlines that despite its success in the Dayton market with passenger load factors in the high seventy and low eighty percent range, the airline has decided to leave the market in June 2017. 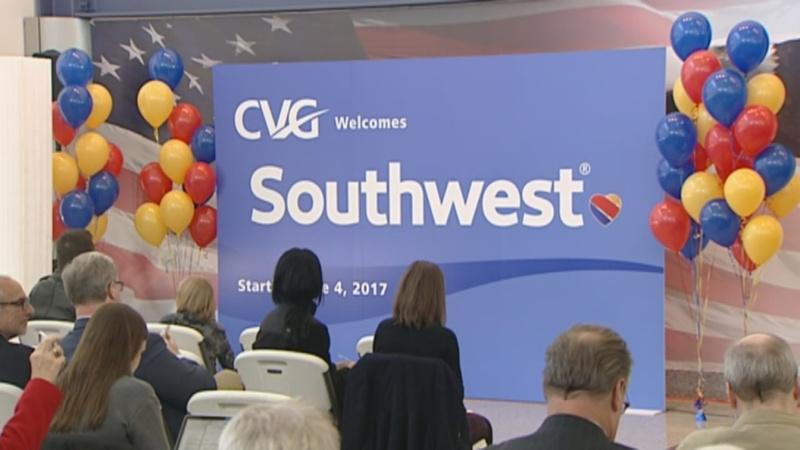 Southwest’s announcement signals a growing trend in the airline industry of concentrating service in larger hub markets. “Unfortunately the trend has meant smaller to medium-size markets including Dayton have been losing routes,” said Terrence Slaybaugh, Dayton’s Director of Aviation. Southwest has been flying out of Dayton since 2012. Last year, the airline made a change in service by limiting their flights to Chicago only. They had three flights a day out of Dayton. The city says this move will not affect the number of flights with non-stop service from Dayton to Chicago because American and United have several to O’Hare every day. CHARLESTON, W.Va. (WSAZ) -- A man is wanted in connection with a stolen credit card investigation in Charleston. Police say Melick Hall, of Nitro, ran from officers at Yeager Airport. According to the Yeager Airport Police Department, Hall is wanted in connection with a stolen credit card and two felony counts of fraudulent use of electronic access device. Hall allegedly ran from airport police Wednesday Jan. 4. 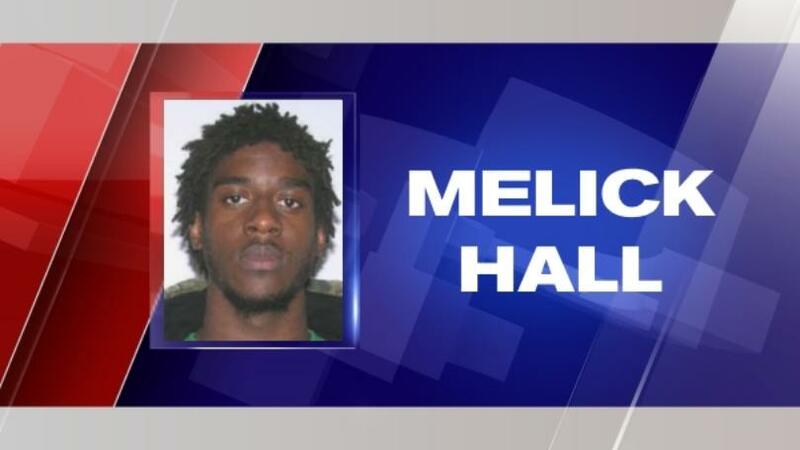 Police say Hall is also wanted for failing to appear in Kanawha County Magistrate Court from back in November of 2016. Investigators say Hall is known to carry a gun. He is described as a 23-year-old black man, 6'3 and 190 lbs. Hall is known to have an address in Crossroads Village in Nitro. If you have any information about his whereabouts, contact your local police department or the Yeager Airport Police Department at 304-344-5158. The private pilot was conducting a cross-country personal flight. He reported that he entered the downwind pattern at his home airfield and prepared the airplane to land using the manufacturer's checklist, which included selecting the fullest fuel tank, setting flaps to 5°, and lowering the landing gear. While on an extended downwind leg, the pilot noticed that the airplane had descended to between 700 and 800 ft above ground level, so he added engine power to climb back to pattern altitude, but the engine stopped producing power. The pilot turned the airplane toward the runway, which he estimated was more than 1.5 miles away. He realized that he was not going to be able to glide the configured airplane to the runway, so he performed a forced landing to a field but landed short in a wooded area. Examination and testing of the engine did not reveal any anomalies that would have precluded normal operation. Maintenance had recently been conducted on the fuel selector’s union fitting. The mechanic who conducted the maintenance reported purging the lines of air and conducting a successful postmaintenance test flight before releasing the airplane to the pilot. The reason for the loss of engine power could not be determined. The loss of engine power for reasons that could not be determined because postaccident examination and testing of the engine did not reveal any anomalies that would have precluded normal operation. 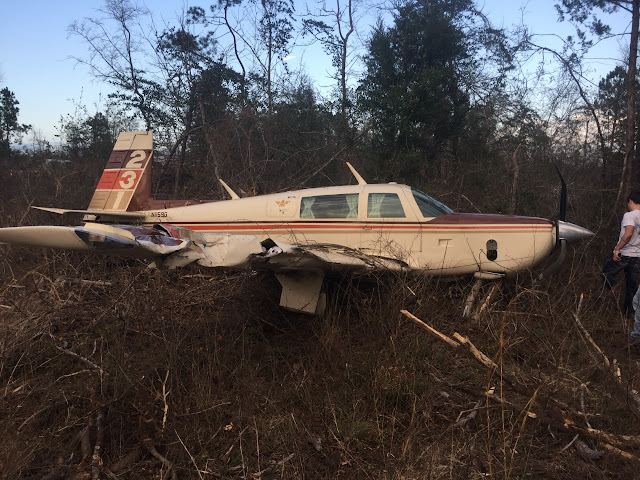 On January 4, 2017, about 1545 central standard time, a Mooney M20K airplane, N1159G, conducted a forced landing near Nacogdoches, Texas. The private rated pilot sustained minor injuries and the airplane was substantially damaged. The airplane was registered to and operated by a private individual under the provisions of 14 Code of Federal Regulations Part 91 as a personal flight. Visual meteorological conditions prevailed for the flight, which operated without a flight plan. The flight departed the Kerrville Municipal Airport and was about to land at the A L Mangham Jr Regional Airport (OCH), Nacogdoches, Texas. The airplane had recently undergone an annual inspection and the flight was the second flight since the inspection. The pilot reported that the preflight and flight was uneventful until he entered the pattern to land at OCH. The pilot prepared the airplane to land using the manufacturer's checklist, which included changing to the fullest fuel tank, which was the left fuel tank, setting flaps to 5° and lowering the landing gear. While on an extended downwind leg, the pilot noticed that his altitude dropped to 700 to 800 ft above ground level, so he added engine power to climb back to pattern altitude. The airplane's engine stopped producing power without any vibrations or sputtering. The pilot turned the airplane towards the runway and estimated the distance to be more than 1.5 miles from the end of the runway. He set up best glide but perceived that the airplane was descending too quickly to make the runway. The pilot performed a forced landing to a field but landed short in a wooded area. The airplane was moved to a secure location and several engine runs were conducted. Testing included scenarios with the fuel lines not purged of air. Engine runs with the left fuel line not purged of air, the engine would stop producing power if the pilot did not intervene and either activate the boost pump or switch back to the right tank. Testing found that when purged of air, the engine operated normally. Examination of the airframe found no anomalies. Examination of the fuel selector found no anomalies and each switch position was easily discerned. The mechanic, who has worked on Mooney airplanes for 48 years, provided a statement concerning the work performed on the airplane prior to the accident. During N1159G's annual inspection, a discrepancy found were numerous fuel stains throughout the belly panels. The source of the leak was determined to be the o-rings on fittings in the fuel selector valve. The mechanic was familiar with the fuel selector valve and suspected that the o-rings were deteriorated. To perform the required replacement, both fuel tanks were drained and the fuel selector valve was removed from the airplane. The fuel selector was not disassembled and the four unions were removed. The O-rings were replaced and the fittings were torqued. The selector valve was reinstalled and the fuel tanks were refilled with the fuel that had been previously removed and filtered. The fuel selector was moved from the off position to the left position and the fuel supply to the valve was purged of air thru the gascolator drain valve. The selector was then moved to the right position and the right fuel line to the selector was purged of air thru the gascolator drain valve. Inspection showed no leaks and after several days was re-examined and found not leaking. The annual inspection and repairs were completed. The mechanic, who is also a pilot, performed a post maintenance flight that included selecting both the left and right tanks during the preflight, taxi, and flight portions. He did not detect any leaks during the post flight inspection. The pilot has owned N1159G for almost 25 years and has at least 941 hours in the airplane without a similar incident occurring. On January 4, 2017, about 1545 central standard time, a Mooney M20K airplane, N1159G, conducted a forced landing near Nacogdoches, Texas. The private rated pilot sustained minor injuries and the airplane was substantially damaged . The airplane was registered to and operated by a private individual under the provisions of 14 Code of Federal Regulations Part 91 as a personal flight. Visual meteorological conditions prevailed for the flight, which operated without a flight plan. The flight departed the Kerrville Municipal Airport and was about to land at the A L Mangham Jr Regional Airport (OCH), Nacogdoches, Texas. According to preliminary information, the airplane had recently undergone an annual inspection and the flight was the first flight since the inspection. While in the pattern to land at OCH, the pilot switched fuel tanks and the engine stopped producing power. The pilot performed a forced landing; however, the airplane sustained substantial damage to the wings during the landing. 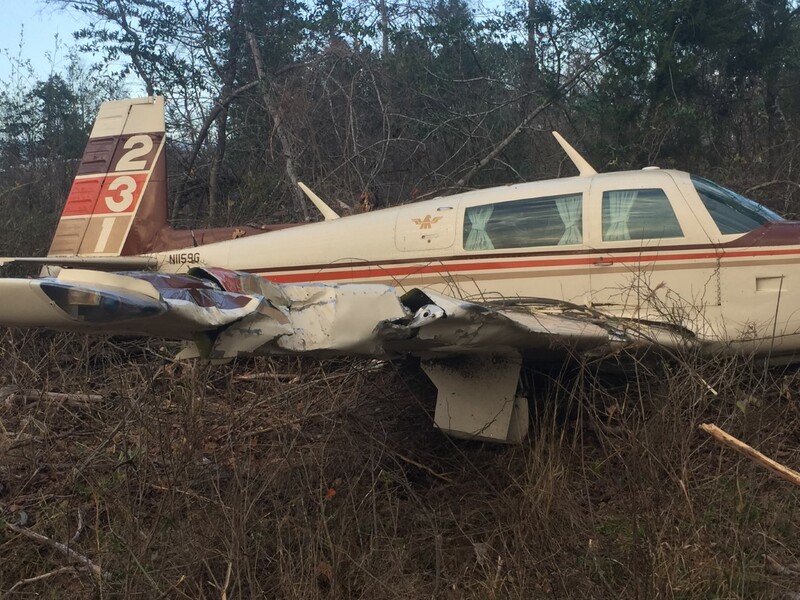 Nacogdoches County, Texas -- An East Texas pilot was able to walk away from a Nacogdoches County crash site with no injuries. 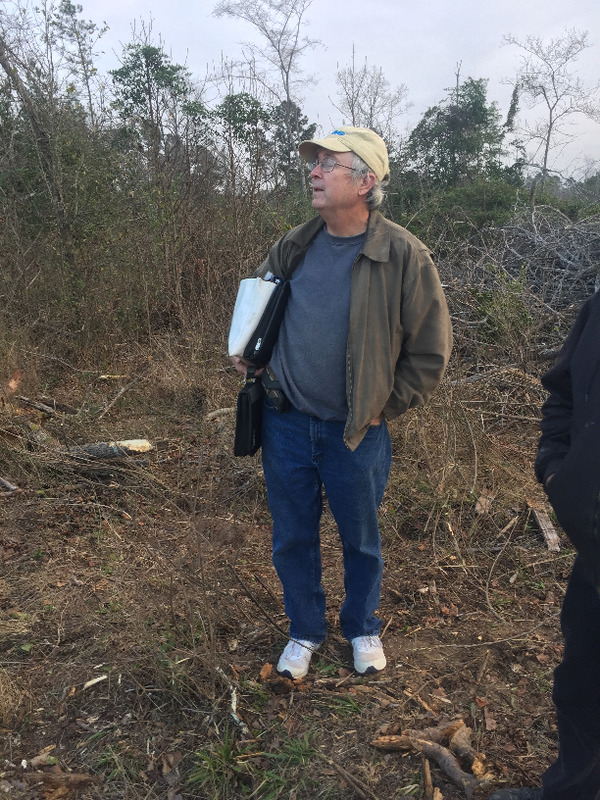 According to officials, the plane went down around 4:00 p.m. Wednesday, near Terry Crawford Road. The crash site is located off Highway 7 near the A.L. Mangham Jr. Regional Airport. The plane, identified as an Mooney M20K 231, is registered to Donald Keith Irby of Cushing. Officials say Irby began to have engine failure before gliding into the field. He was not seriously injured in the crash. According to the pilot, he had flown from Nacogdoches to Longview to get his yearly inspection. On the way back, Irby stated he had engine failure close the airport. The pilot said he was able to put the plane down safely in a field which had recently been clear cut. Irby said despite the scary incident, he will continue to fly, but he will need to replace his now totaled aircraft. No other passengers were on board the plane. The FAA is investigating the accident. NACOGDOCHES COUNTY, TX (KTRE) - A plane has crashed in the area of State Highway 7 in Nacogdoches County. 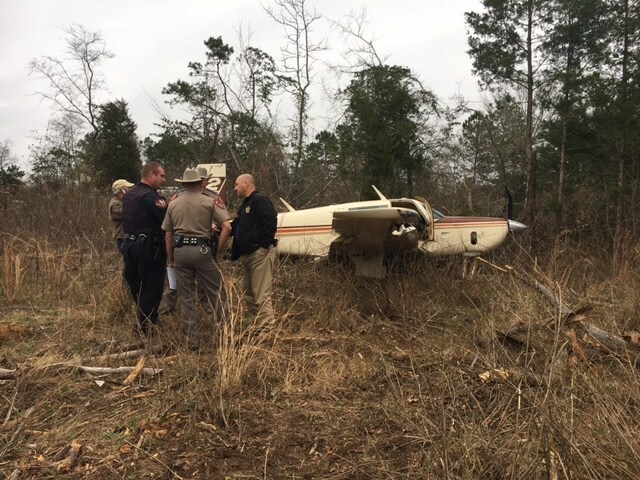 According to DPS spokeswoman Stephanie Davis, the crash occurred in a wooded area near Terry Crawford Road around 4 p.m.
Donald Keith Irby, 63, of Sugarland, said he had picked up his plane in Longview after having it inspected. 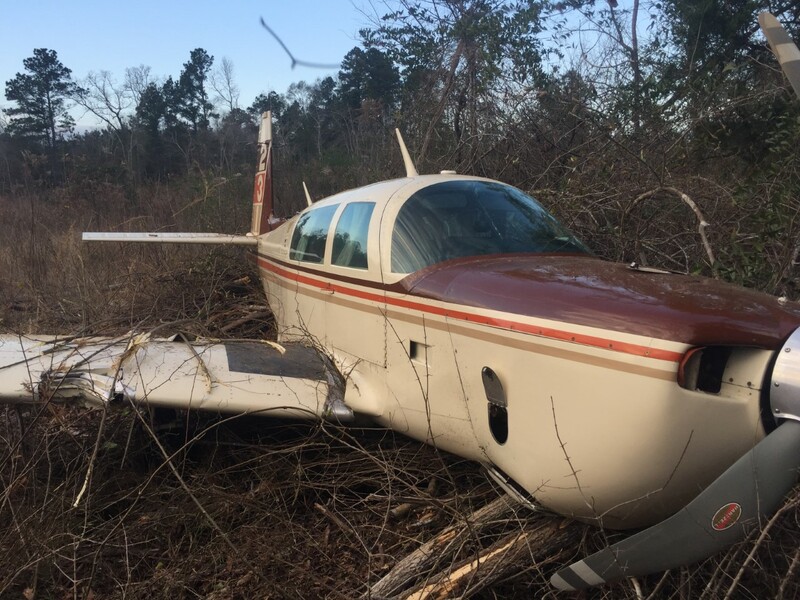 He was on his way to the Nacogdoches County airport when his engine began cutting out and he knew he had to find a safe landing spot and landed it in a clearing of dead trees. Irby, who owns a ranch in Cushing, said he has some pain to his legs but, other than that, is fine. 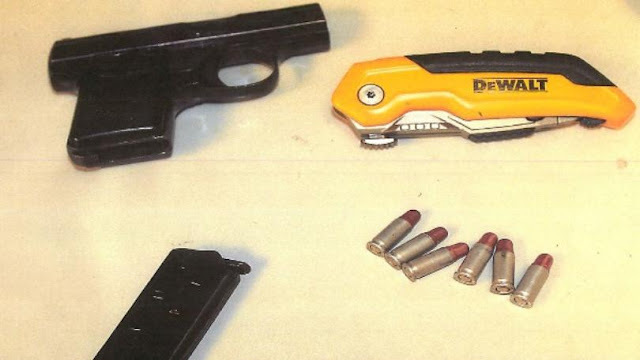 CHARLESTON, WV (WCHS/WVAH) — Yeager Airport Police confiscated a semi-automatic pistol and box cutter from a man at a Transportation Security Administration checkpoint Tuesday night in Charleston. 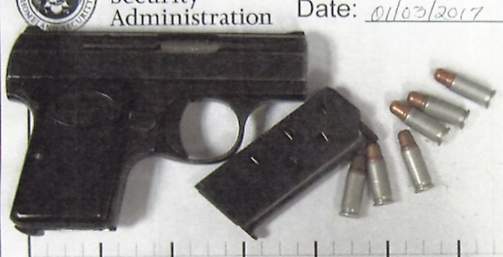 The gun, a Browning .25 caliber, was loaded and in the man's carry on bag, according to a news release from the airport. The incident occurred about 6:25 p.m., the release said. Police said the man, identified as James Cordell Menear, 62, of Huntington, was issued a citation by police. The firearm was the first of 2017 to be confiscated by Yeager Airport police. Ten firearms were confiscated in 2016 at the airport. "We strongly urge all travelers to pay heed to the signage in the airport regarding firearms and double check their carry on baggage before attempting to pass through the security check point, " Yeager Airport police chief Joe Crawford said in the release. Weapons, including firearms, firearm parts and ammunition, are not permitted in carry-on bags at airports, but can be transported in checked bags if the guns are unloaded, properly packed and declared to the airline. Passengers who bring guns to airports could face criminal charges and fines of up to $11,000 from the TSA. 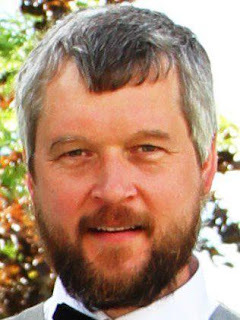 A Virginia Tech researcher has died after he and his family were in a plane crash in Wisconsin this week. Cory Papenfuss of Dublin died from injuries sustained during a plane crash in Brookfield, Wisconsin, on Jan. 4, according to a university press release. 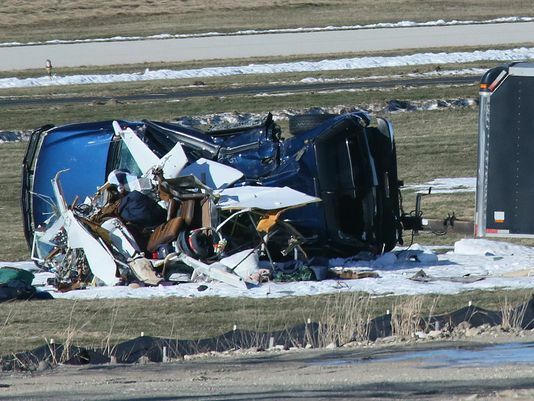 The City of Brookfield Police Department responded to the crash at Capitol Airport about noon that day and found the 41-year-old pilot and his 37-year-old wife, Carmen Papenfuss, seriously injured, according to a press release from the department. Their 5-month-old son was found with less severe injuries. 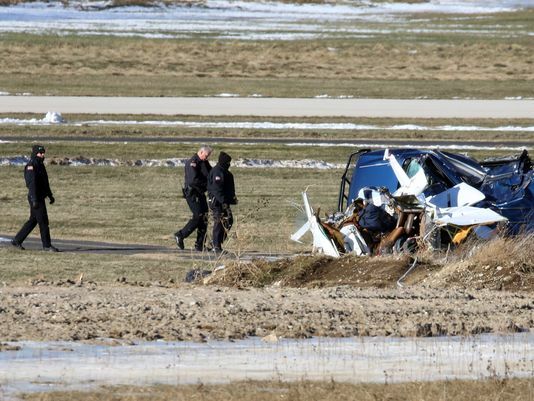 The single-engine plane crashed into an unoccupied SUV parked in the grass east of the runway during takeoff. The adults were taken to Froedtert Hospital in Milwaukee and the child to Children’s Hospital of Wisconsin, also in Milwaukee. An administration official with Froedtert Hospital declined to comment on Carmen Papenfuss’ condition on Saturday. According to a website set up as a fundraiser for the family, the mother is in critical condition with serious injuries, but is conscious and stable, while the son, Ben, suffered two broken legs in the incident, but is otherwise fine. Cory Papenfuss had been employed by Tech since 2006, where his work in the vibrations and acoustics lab was based on passive and active noise and vibration control applications that included commercial aircraft, military diesel generators, and prenatal hospital incubators, according to the university. The family was attempting to return to Virginia after visiting extended family in Wisconsin at the time of the crash. As of Saturday the fundraiser had already topped its goal of $5,000, reaching $5,490. BROOKFIELD, Wis. — The pilot of a small plane that crashed into an SUV at Brookfield's Capitol Airport at midday Wednesday died several hours later, a hospital spokesperson said. 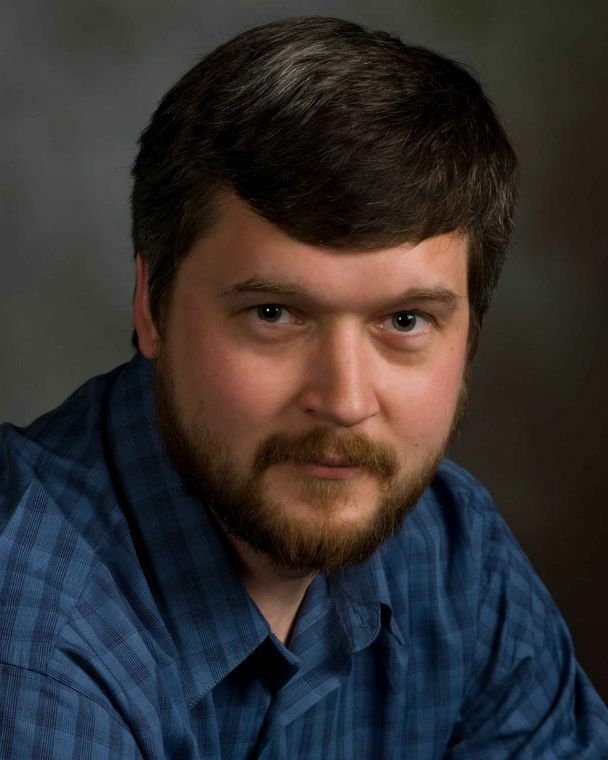 Dr. Cory Papenfuss, 41, was a research scientist at Virginia Tech. A colleague who asked not to be identified said Papenfuss was well-liked and very well respected in his field. Papenfuss' wife and small child survived the 12:08 p.m. Wednesday crash, though the 37-year-old woman was said to be in critical condition at Froedtert Hospital. Their 6-month-old son was not injured but was taken to Children's Hospital of Wisconsin as a precaution, Brookfield Capt. Phil Horter told reporters about an hour after the incident. Flight for Life transported at least one of the people, but Horter couldn't identify who it was. The cause of the crash is still unknown, but wind speed and direction may have played a role. "There's got to be some extenuating circumstances that would cause that problem today I would say," said pilot David Mann, who was out flying Wednesday in another plane that's a little larger than the one that crashed. "I flew a light twin from here up to Waukesha just this afternoon, and it was quite bumpy out," Mann said. "You had to be careful, but I don't think it was too windy to fly." Wind speeds at Mitchell International Airport and Lawrence J. Timmerman Airport exceeded 20 mph shortly before noon. A gust at Mitchell at 11:52 a.m. reached 29 mph. No one was in the SUV that was struck by the plane, Horter said. A trailer attached to the SUV has a "Bad News Racing Team" logo on the side. 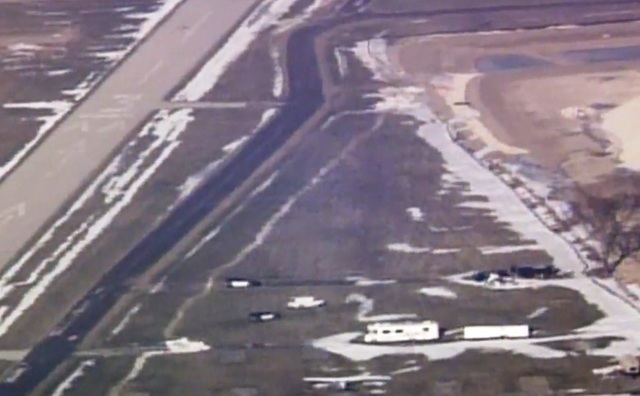 The airport at is 21500 Gumina Road in Pewaukee. Several dozen aircraft use the airport each day. The FAA and NTSB are now investigating the crash. 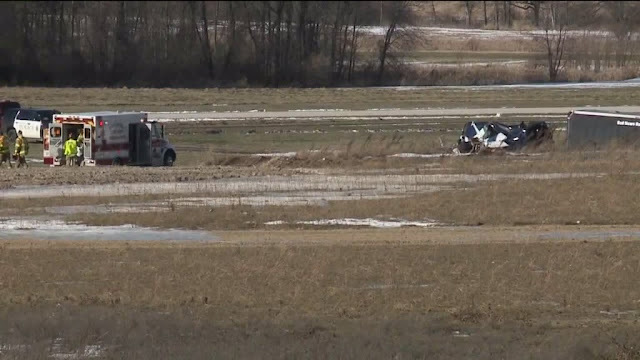 UPDATE: The pilot of the plane that crashed Wednesday afternoon in Brookfield has passed away. Froedtert Hospital says he passed away Wednesday evening at the hospital. His wife remains hospitalized in critical condition. 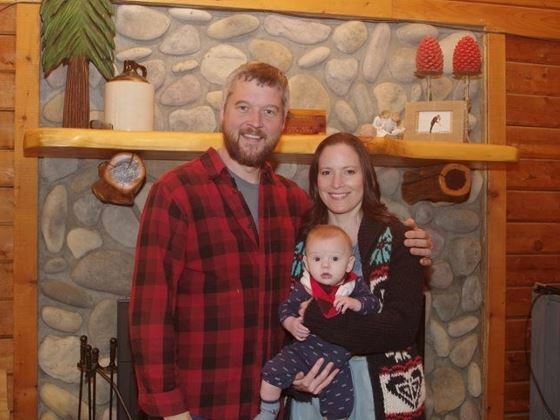 The couple’s son was treated at Children’s Hospital of Wisconsin and is in good condition. The family has asked for privacy during this difficult time. BROOKFIELD, Wis.-- A small plane crash injured two adults with an infant on board at the Capitol Airport in Brookfield Wednesday. Around noon Wednesday, police said a single engine airplane was attempting to take off when it ran off the runway. 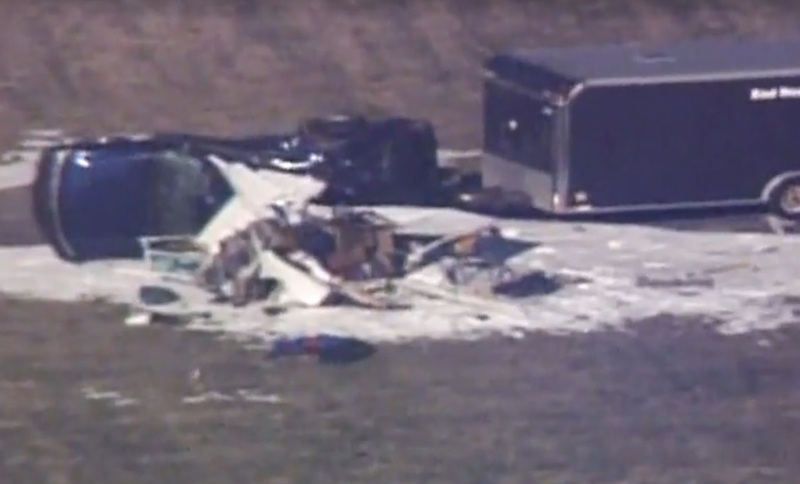 The plane crashed into a parked SUV with an attached trailer. "The airplane itself appears to have significant damage," said Capt. Phil Horter with the Brookfield Police Department. Police and fire crews arrived on scene to find three occupants of the mangled plane, a Virginia family that was in town visiting for the holidays. The pilot, a 41-year-old man, and his 37-year-old wife were taken to the hospital with serious injuries. "I believe all of the patients were conscious,” said Horter. Police say their 6-month-old baby was in the back of the plane in a child seat. "The infant did not appear to be injured at all, but was taken to the hospital to be checked out," said Horter. Horter said some of the victims were taken to the hospital by Flight for Life, others were taken by ambulance. Chris Adams owns a small business across the street from the airport. He came back from lunch to a flood of police, fire crews and first responders covering the rural airport's property. "Coming back from lunch it was really, really windy so I imagine that doesn’t help when you’re in a small experimental type of aircraft," he said. Police said the cause of the crash is unknown at this time, however preliminary stages of the investigation are underway. "I just hope everyone is OK I mean that’s obviously the first priority especially the infant and the family up there," said Adams. Brookfield investigators reconstructed the crash Wednesday afternoon. The FAA will conduct its own investigation. Two people were seriously injured in the crash of a small plane at the Capitol Drive Airport in Brookfield. Emergency crews responded to the scene at approximately noon Wednesday, Jan. 4. There were three passengers from Virginia aboard the single-engine aircraft — a woman, her husband and their infant son, according to a news release from City of Brookfield Police Capt. Phil Horter. The 41-year-old man — the plane's pilot — and his 37-year-old wife were seriously injured in the crash, Horter said. Their son, approximately 6 months old, was in a child seat in the back seat with his mother and did not appear to have any obvious injuries. Horter said the family had been in Waukesha County visiting family and were on their way back to Virginia after the holidays. The man and his wife were transported to Froedtert Hospital in Wauwatosa and the infant was taken to Children's Hospital in Wauwatosa to be checked out. Spokespeople for Froedtert and Children's Hospital declined to release any information regarding the names or the conditions of those involved in the crash. Horter said the airplane crashed during takeoff, going off the east side of the runway and crashing into a parked SUV with a trailer attached. No one was in the vehicle, Horter said. There did not appear to be any fire in the plane or the vehicle, but the plane did appear to have significant damage. The initial investigation into the accident was conducted by the City of Brookfield Crash Reconstruction Team, Horter said, but has since been turned over to the FAA, which will be working with the National Transportation Safety Board. The airport will be closed for 24 hours but the roads and traffic in the area will not be impacted, Horter said. 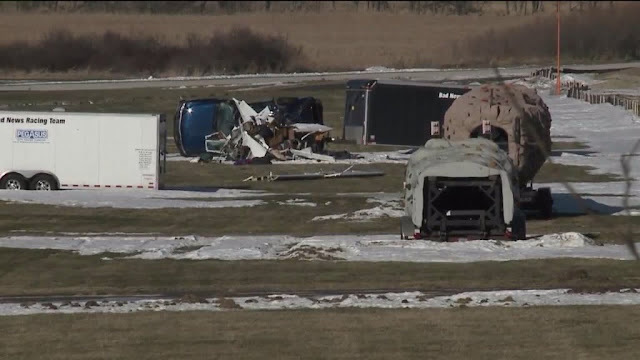 BROOKFIELD -- A pilot and his wife were seriously hurt when a plane crashed while attempting to take off from Capitol Airport in Brookfield Wednesday, January 4th. Miraculously, their six-month-old child is OK. It happened around noon at the airport on Gumina Road. 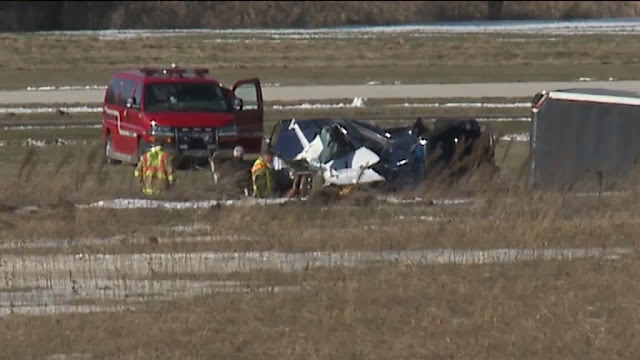 According to the Waukesha County Sheriff's Department, while attempting take off from the airport, the single-engine plane ran off the runway, and crashed into a parked blue SUV that had a trailer attached to it. The plane crashed to the east of the paved north-south runway, approximately mid-field. There was no one in the parked SUV -- but there were three people in the plane. "A husband and wife, approximately in their 30s, and they also had a small infant in the airplane with them -- approximately six to 12 months old," Brookfield Police Captain Phil Horter said. Miraculously, the pilot -- a 41-year-old man from Virginia, his 37-year-old wife and the six-month-old baby boy were alive and conscious when first responders arrived. Officials said the baby didn't appear to be hurt. He was in the back seat with his mother -- in a child seat. The pilot and his wife were seriously hurt. The two adults were transported to Froedtert Hospital, the child to Children's Hospital -- all were transported by Flight for Life or by the City of Brookfield Fire Department. Police have not identified the family involved in the crash. Police said the pilot has family living in Waukesha County and had been in town visiting. 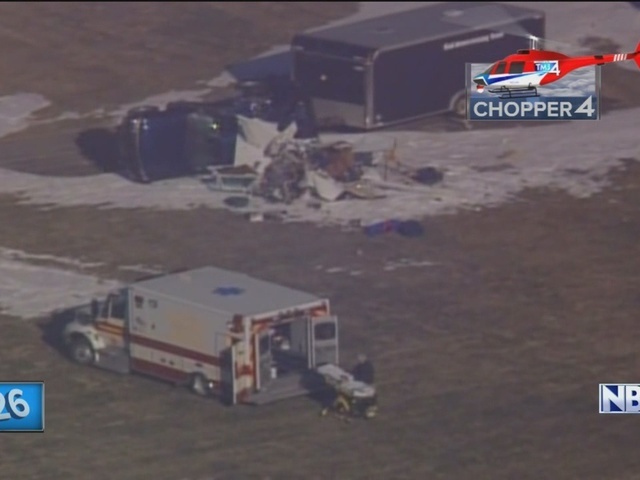 They were headed back to Virginia after the holidays when this crash happened. Chris Adams works at CCA Computers across the street from where this happened. "As soon as we got here, we noticed Flight for Life was here already," Adams said. Captain Horter said by no means is Capitol Airport a busy airport -- especially this time of the year. "Certainly during the winter, it`s unusual to see planes going in and out of here in the winter," Captain Horter said. The City of Brookfield Police Department has turned this investigation over to the FAA and NTSB. Authorities say the airport is expected be closed for approximately 24 hours. A Virginia couple and their infant son were injured after their plane crashed while taking off at Capitol Drive Airport in Brookfield during the noon hour Wednesday. Brookfield police said the single-engine plane may have been caught in crosswinds while taking off, causing it to crash midway along the airport's only paved runway, on the east side of the airfield. Strong westerly winds of 18 knots, gusting to 23 knots, were recorded at the airport, which has no flight control tower, at the time of the crash. The pilot, a 41-year-old Virginia man, and his 37-year-old wife were seriously injured in the crash, City of Brookfield Police Capt. J. Philip Horter said in a release. The baby, who is approximately 6 months old, did not appear to have any obvious injuries but was taken to Children's Hospital by ambulance as a precaution, police said. Flight for Life took the adults to Froedtert Hospital. The mother was sitting in the plane's back seat with her son, who was restrained in a child seat. The wings broke off the plane, which was laying in pieces Wednesday afternoon as investigators from the Brookfield's crash reconstruction team worked to learn what happened. The plane struck a vehicle towing a trailer that was parked in the grass at the side of the runway at the airport, 21500 Gumina Road. No one was inside the vehicle. The couple was visiting family in Waukesha County for the holidays and flew out of the airport to travel home to Virginia. 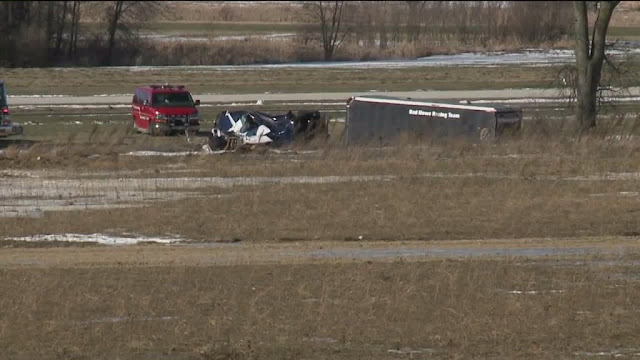 The crash is being investigated by the National Transportation Safety Board and FAA. Capitol Drive airport will be closed for at least 24 hours, police said. 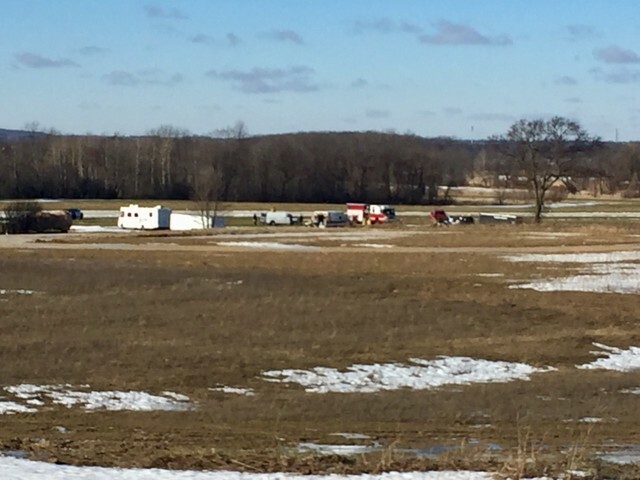 BROOKFIELD, Wis. — Three people were on board a small plane that crashed into a vehicle parked near a runway shortly after takeoff at Capitol Airport on Wednesday. 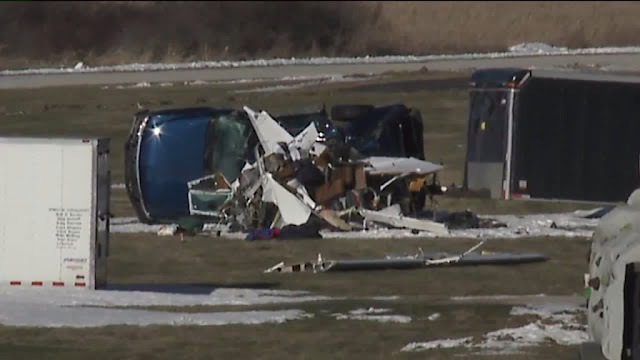 All three -- a male pilot, his wife and a small child -- survived the crash, Brookfield Capt. Phil Horter told reporters about an hour after the 12:08 p.m. crash. The 6-month-old boy was not injured but was taken to Children's Hospital of Wisconsin to be checked out, Horter said. The pilot, 41, and his wife, 37, were both injured and taken to Froedtert Hospital in Wauwatosa. The family lives in Virginia but has family in Waukesha, an official said. 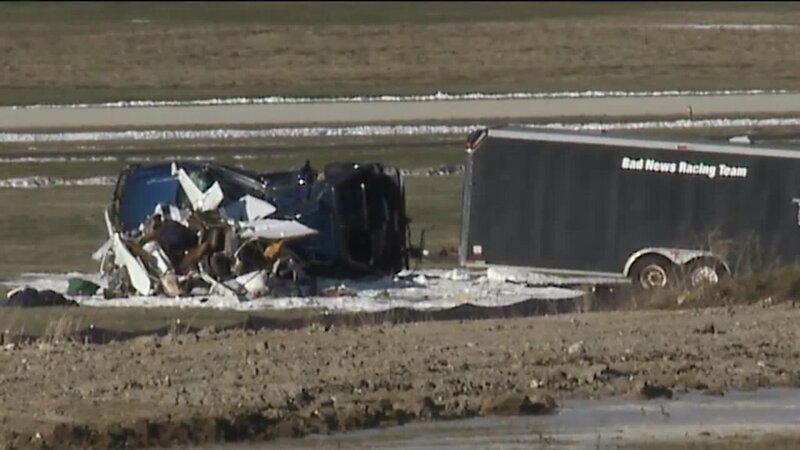 (BROOKFIELD, Wis.) — Three people, including an infant, survived after a small plane crashed into a parked car near an airport runway in Wisconsin, according to authorities. A male survivor suffered the most serious injuries, according to the Brookfield Police Department. The extent of his injuries was not known. The man’s wife was not as seriously injured, and the infant did not appear to be injured, police said. All three passengers were conscious when emergency responders arrived at the scene. The man and his wife were taken to Froedtert Hospital in Wauwatosa, while the infant was taken to Children’s Hospital of Wisconsin to be checked out as a precaution, police said. The three were from out of state, according to police. The single-engine plane had departed from Capitol Airport when it lost altitude, according to a Federal Aviation Administration spokesperson. It is not clear where the plane was traveling to. It is not clear whether the plane struck something before it crashed into the parked car, police said. No one was in the vehicle when the plane crashed into it. Both the plane and vehicle suffered significant damage, according to police. The FAA is investigating the crash. The airport will be closed for the next 24 hours. The plane and vehicle each suffered significant damage according to authorities. 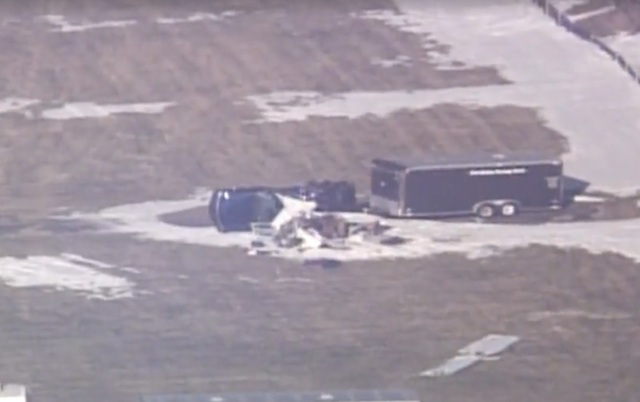 BROOKFIELD, Wis. (AP) - Police say three people on board a small plane have been injured when the aircraft crashed into an SUV and trailer as it tried to take off from a suburban Milwaukee airport. 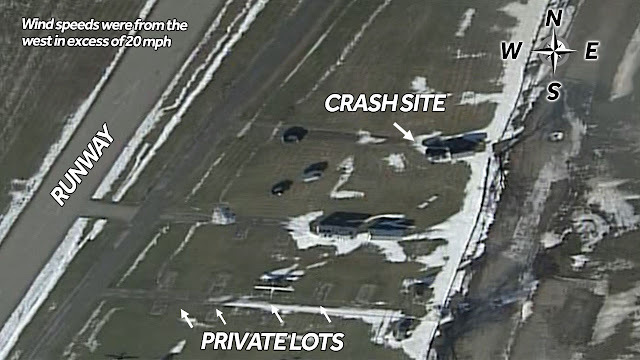 Aerial video shows the plane was destroyed when it hit the SUV around noon Wednesday at Capitol Airport in Brookfield. Authorities say no one was in the SUV when it was struck. Police say the three injured people were rushed to a hospital. The Federal Aviation Administration is investigating.